Life without achar/pickle is very difficult. I love to have some achar with rice. Hubby love mango achar, his favorite brand being Bedekar’s, however they are not available here, so he is trying homemade ones. Store brought achar has preservative and is high in salt compared to homemade ones. For a wedding feast or onam feast, you can see 4 or 5 types of achar being served, with the usual achar being mango, lemon, ginger and Indian gooseberries. I am not a fan of mixed vegetable achar or garlic achar. But I love mango, ginger, Indian gooseberries and lemon achar. I also love sweet and sour lemon pickle. Making Naranga achar/lemon pickle was not easy at least for me. I spoiled almost 12 lemons in the name of pickle making. Finally I perfected my way of making good pickles. Traditionally there are two ways you can prepare lemons for pickle making. First fry them with little gingerly oil until the skin gets soft and cut them into bite size pieces. Second method is to steam the lemons for 8-15 minutes or until their skin gets soft and then cut into bite size pieces after removing the seeds and the median membranes. One more thing you need to be extra careful of is to not to have any drop of water in bottles or spatulas you are planning to use in the lemon achar making. It is just like egg white which doesn’t like any water drop while being whipped. I was able to get success with steaming method. Lemon that I get here in US has thick skin compared to Indian counter parts; I think that may have contributed to the earlier failures. Since I was testing my pickle making skills, I didn’t make it this achar as sweet and sour. Next attempt will focus on that. This time I made a fiery hot lemon pickle which has good tanginess by itself. I made this lemon pickle by steaming the lemons for about 15 minutes and then dried them with kitchen towel and added gingerly or Indian sesame oil, red chili powder, asafetodia, curry leaves, green chilies, garlic, fenugreek seeds and salt. Usually lemon juice is enough to get correct consistency of achar, still if you prefer slightly loosened form of pickle use only boiled cooled water. I didn’t add any vinegar as lemons are tangy by itself. If you want more tanginess add vinegar. I used my mom’s recipe to make the achar. Here goes the recipe. In a medium sauce pan heat 4 cup water and bring to boil once boiled add lemons and cover and set aside for 15-20 minutes or until the skin gets soft. (If you have Asian steamer in hand take it out and use it now). Wipe the lemon with dry kitchen towel so that there will be no water. Cut the ends and then cut them in to half and then each piece into half and again into half. So you will able to get the bite size pieces. In a small pan heat oil and add mustard seeds and halved red chilies once mustard seeds starts popping add green chilies, garlic cloves and curry leaves and fry them until they are crisp. Switch off the flame and add chili powder, turmeric powder, salt asafetodia and fenugreek powder and fry for a minute. To add cut lemon pieces along with juice. And mix everything so that spices get coat to each piece and set aside at room temperature for 24 hours. Then set aside for about 15 days or until chili powder and salt gets into the lemon pieces. (I like to keep them inside refrigerator). Make sure to clean the bottle and caps you planning to use for lemon pickle should wash with hot water and dried well without any water content. This looks like a great pickle! I love the heat! I love spicy pickles with rice too.This looks very yummy! Looks yum! Totally agree that store bought pickles are way saltier to the home made ones. Slurp, spicy and tempting pickle…seriously delicious..
he he Swathi I am drooling here,Can u parcel some lemon pickle and send me? It looks so tempting and lovely. WOW…never thought of making pickle at home and that looks awesome…you made it so easy..thanks for the recipe..
vayil ninnum vellam vannu…Kiddu pics and recipe…. I’ve never tried these lemon pickles…so yummy and tasty, love the spices you used to make them. I’m a “pickle” fan, so this would be right down my alley! Looks mouthwatering… love to have this with any dish. I have never heard of these pickles, they look so good. I bet my husband would love this! So much time and care you put into perfecting these Swathi! They look wonderful!! Kidulam!! ente vayil vellam niranjuttoo..ente draftilum undu onnu..have to post it..
Looks drool-worthy. Just the pic itself is enough to start salivating. I have a weakness for lemon pickles and urs looks mouth watering and delicious! Yum. I bet your pickles are so good. My mom has made lots of lemon pickle this winter too, with lemons from her trees. They’re very flavorful, aren’t they? I agree, homemade is better, less salt, sugar and no preservatives. This looks so good for rice! These look so beautiful. I love mango pickles and have not tried lemon. I will have to give them a go. That pickle sure looks fantasticccccc…. MY mom makes a lot of pickles and i help her , with oil , w/o oil , with juice or with vinegar and what u, and u r rite , meals get wonderful with pickles on the plate! those lemons are soo perfectly yellow! I love finding new pickling recipes and this sounds delicious! thanks for sharing! My fav in achars is this one. 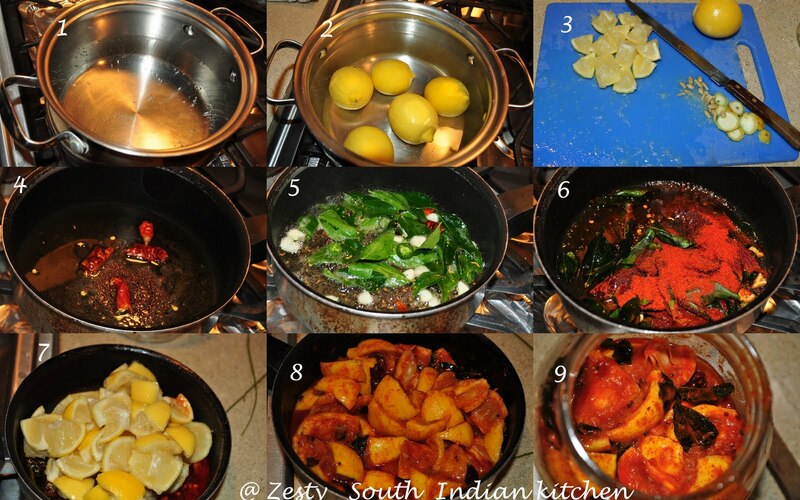 Looks good swathi..
tongle tickling spicy tasty recipe..thanks Swathi for sharing..
Mouthwatering pickle! I so wish to taste this now 🙂 Yumm!!! Mmm, super delicious and healthy! I bet this is so good with so many different things! absolutely drooling… thanks for sending the yummy pickle to my event. I wanted to try your recipe but I’m a beginner. How long can I keep this achar now that its winter time? Is refrigeration necessary? Will it keep longer is I refrigerate? Do I need to make sure the oil covers all the achar when I place it in the jar? Any other tips you can share would be very helpful. Thanks! If oil cover the achar then it will be fine. Also if you make it more spicy means some extra chili and salt then it will be fine. you can keep this out for few days and then refrigerate it will increase it life.